Group 1 winning sprinter Brave Smash will wear the blinkers again when he lines up in tonight’s Group 1 $1m Ladbrokes Manikato Stakes (1200m) at The Valley. 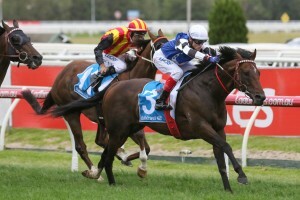 Brave Smash, above in blue, black and white colours, will wear the blinkers again in the Manikato Stakes at The Valley. Photo by Ultimate Racing Photos. Premier trainer Darren Weir is willing to forgive Brave Smash for his last start failure in the $13m The Everest (1200m) at Randwick a fortnight ago and is expecting a better showing tonight. Brave Smash settled in the second half of the field and failed to make up any ground on the heavy track when eighth to Redzel in The Everest and Weir is hoping the conditions will suit the Japanese import better at The Valley. “It didn’t work out for Brave Smash in The Everest. I wouldn’t say it was the heavy track there, he didn’t flounder in the ground, it was more a case of the backmarkers didn’t really come into it,” Weir wrote in his column on Racenet. Brave Smash has raced consistently for Weir since arriving from Japan in the middle of 2017 and was able to claim Group 1 glory with his win in the $500,000 italktravel Futurity Stakes (1400m) at Caulfield during the 2018 Melbourne Autumn Carnival. The six year old has also been Group 1 placed on three other occasions and was second two starts back too Viddora in the Group 1 $500,000 Charter Keck Cramer Moir Stakes (1000m) at The Valley on September 28. Brave Smash has drawn barrier nine in the fourteen horse Manikato Stakes field and will be ridden again by Hugh Bowman who has been aboard for his last three Spring Carnival starts. Weir will also saddle up Voodoo Lad who has drawn barrier eight with Mark Zahra taking over from the injured Brad Rawiller. The Tony McEvoy trained Sunlight is the ruling favourite for the Manikato Stakes at $4.60 at Ladbrokes.com.au and the Zoustar filly will jump from gate three with Tim Clark on top. Brave Smash is marked at $9 while Voodoo Lad is at the double figure odds of $15.